You probably know by now that your thoughts about drinking are an important piece of your drinking habit. 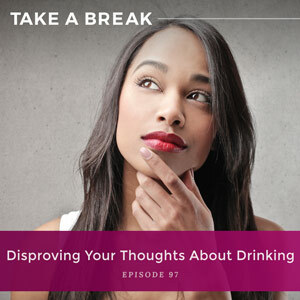 I talked on last week’s episode about how to figure out what you really think about your drinking. Now that you have the tools to discover your beliefs about drinking – the stories you’ve picked up from friends, family, and media about what it means to drink (or not) – you need tools to disprove those beliefs if you want to change your habits. I used to be really committed to a lot of my beliefs about drinking, like “not drinking is boring” and “everybody drinks,” and they held me back. On this episode, I share a technique called “The Turnaround” that helped me challenge these beliefs and finally change my thoughts, and eventually, my desire. Listen below as I describe six beliefs I used to hold about alcohol and drinking and some turnarounds you can use to shift your mindset. Why you have to do more than just saying “no” to a drink if you want to change your desire for alcohol. How uncovering my judgments about alcohol helped me realize how much I used it as a coverup for emotions like anxiety and shame. Why positive thinking by itself isn’t enough to shift your mindset around drinking. How your brain uses your thoughts as a lens for the world and seeks out information that reinforces what it already believes. The Turnaround technique and how it can be used to challenge six common thoughts about drinking. 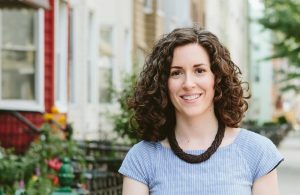 You are listening to the Take A Break podcast with Rachel Hart, episode 97. Well hello, hello everybody. It is a couple days before Thanksgiving and I cannot believe that December is almost here. Where did this year go? I’ve had so many crazy changes this year, but I’m so excited for 2019. I am launching a program called In Pursuit. It is a year-long intensive coaching program that really is going to help people who have really been able to change their drinking but feel like something is missing. They feel like they still are struggling with insecurity, anxiety, self-doubt, and constantly feeling like you’re heading into a new year wondering again, “Okay, is this the year I’m going to fix myself?” You don’t need to fix yourself. That is what this program is all about. It is about helping you create a life that is way bigger and way better than what is ever in your glass. So if you guys are interested, I’m still accepting applications. Just head on over to rachelhart.com/inpursuit to apply. And that’s what I want to help you on today’s episode figure out. Once you’re aware of these judgments, how do you start to change them? Now remember, alcohol and drinking is neutral. It doesn’t mean anything about you. But here’s the thing; when you want to change the habit, alcohol and drinking do not feel neutral. They feel supercharged. You might be thinking to yourself, “I’m always going to be missing out if I’m not drinking,” and then feeling deprived. Or you’ll be worried that people might think you’re a killjoy and feel a little embarrassed. Or you might be telling yourself, and I told myself this one for a long time, “I’ll be the only one who’s not drinking,” and I felt so much shame when I thought about that. So the reason why you have all these supercharged feelings about alcohol and drinking and it doesn’t feel neutral is because your brain has adopted so much story about what alcohol means about you as a person. Now here’s the good news, it’s just story. It’s just thoughts that you unconsciously picked up. Maybe they were programmed by media or family or friends, but the story can change. Drinking and alcohol really is neutral. And I’m going to tell you this; it means nothing about who you are as a person. It took me a long time to wrap my brain around this idea but I’ll tell you, when I did, it changed everything. Because here’s the thing; if you want to change the habit, you have to do more than just say no over and over again. No is never going to help you actually change the story that you have about what drinking or not drinking means about you. You have to be able to recognize the story that your brain has created and then start to shift it. And this is where a lot of people get stuck. Because it’s not just enough to go back and really figure out what you think, what your judgments are. You have to have the tools to start to shift them as well. So once you start to see thoughts like, “Drinking is fun, drinking makes things better, drinking helps me open up and relax, people who don’t drink are weird, life without alcohol would be boring,” once you start to see the story that you have around alcohol and how it creates feelings, these thoughts create feelings for you like anticipation or certainty, dependency, judgment, resistance, and how all of these emotions are fueling the habit, what you have to do then is understand alright, so how do I start to prove them not true when they feel so, so true? This is where I was stuck. It really felt like there was no other way for me to think. Drinking was fun. That’s a fact. How could I ever change that? Drinking makes things better. I thought that was just the truth. I was so committed to believing these thoughts, and what I didn’t have for the longest time was a tool to help me disprove them. So that’s what I’m going to help you with today because unless you make the decision to disprove your current belief system, and even if you’re not ready to disprove it, to just be open to challenging it, unless you do this, you will be stuck. The habit will stay in place. You will be unable to change it. And even if you’re able to say no over and over and over again, you won’t be able to change your desire. You will still be feeling deprived. And so that really is the beauty of learning how to disprove your current belief system around alcohol. And here’s the best part guys, and you hear me say this all the time, this is a skill that you can apply to anything in life where you want to change but you feel stuck. Okay, so how do you do this? It is – for a lot of people it seems, well, easier said than done. If I really believe that alcohol is just the only way to have fun or that people who don’t drink are weird, then how am I going to change this belief system? I don’t want to walk around telling myself that I believe something that isn’t true. And this is really something that is important because you hear me talk about how positive thinking is not a solution. In fact, it can work against you. If you start trying to convince yourself to believe thoughts that you don’t believe, if you start trying to just tell yourself over and over again, “Life without alcohol is amazing, life without alcohol is amazing,” your brain’s not going to believe it. Your brain is just going to see it as a bunch of BS. So if you’re feeling like this is really challenging to upend a belief system that you feel very committed to, I don’t blame you. But here’s the piece that most people don’t realize. It’s the think-feel-act cycle yet again. It comes back to your thoughts creating your feelings, your feelings driving your actions, and understanding how that really impacts the habit. Listen, what you believe, whatever thoughts you are thinking, you are constantly proving true in the cycle. Your thoughts are constantly creating evidence in support of them. So they just prove themselves true over and over again, and the reason why a contradictory thought feels like BS is because it is so much easier for your brain to just keep proving what it already believes true. It takes energy and effort to disprove your thoughts, and remember, the brain really cares about saving energy. It really cares about being efficient, and it will continue to do that unless you make a conscious effort to intervene. So I want you to consider this; I want you to consider that the thoughts that you think, even the thoughts that feel 100% true and you could never change them, just consider for a moment that they’re just the lens through which you see the world. They are the lens through which you observe everything around you. Because truthfully, what you believe, you will see. So here’s an example. If you think the world is a terrible place, if that’s the thought you have about the world, that’s the lens through which you see the world, guess what? You will go out and you will find tons of supporting evidence. Everywhere you turn, you will find examples to prove the thought true that the world really is a terrible place. But now here’s the thing, what if someone believed that the world is a magical place? If they truly believed this, guess what? That becomes the lens through which they see the world and they can find tons of supporting evidence that the world is actually a magical place. So who’s right? Which thought is true? The fact of the matter is for your brain, it just depends on the thought that you believe, the thought that you practice over and over again, and the thought that you search for evidence to prove. The world is the same for both people, for the person who thinks it’s terrible, and the person who thinks it’s magical. But two different thoughts produce two totally different experiences of the world because your brain is constantly on the hunt to prove these thoughts true. So then your question is do you want to expend energy disproving the thoughts that are keeping you stuck when it comes to drinking? Do you want to expend energy to disprove the idea that you’ll always be missing out, you’ll always feel deprived, you’ll always feel like the killjoy or the odd man out if you’re not drinking? Do you want to do that? Or do you want to keep thinking these thoughts, having them as the lens through which you see and interpret the world and finding more and more evidence to support them? I hope that you are with me and you want to expend energy learning now to disprove what your brain currently believes because it will change everything, not only for the habit of drinking. This is a skill that is so important when it comes to managing your mind. So I want you to consider a thought like this, “Life without alcohol is amazing.” Now listen, for years I would have looked at that thought and just scoffed at it. But now I am 100% on board. I truly believe that life without alcohol for me is amazing. So what changed? Alcohol is still the same. It’s the same molecular content, it has the same effect on my brain. All my friends still drink. I didn’t move to place where nobody drinks or you never see alcohol. The only thing that changed was that I started finding and creating evidence to support that thought. The thought that life without alcohol is amazing. That’s the only thing that changed. Now, I know some of you are going to say, “That just feels like of fake. I don’t want to trick myself into believing something that isn’t true.” But I want you to consider this; the thought isn’t fake. It’s just yet that you don’t believe it. And the reason you don’t believe it yet is because your brain hasn’t had any practice creating evidence to prove that it is true. So are you willing to challenge your brain to find evidence for a thought like that? Are you willing to expend energy and the effort to disprove the thoughts that are keeping you stuck? So I’m going to run you through a series of thoughts that I used to believe were immutable. They could not be changed. In my mind, they were just facts. I had so much evidence in support of these thoughts, and I will tell you that each one of them kept the habit cycle going until I opened up my brain and decided that I would be willing to challenge them. Now, the thoughts that I’m going to run you through, there’s six of them. For each of them, I’m going to show you how to use a technique called the turnaround. Now, some of you might be familiar with this technique if you are familiar with Byron Katie’s work. Byron Katie has written several books. She is really an incredible thinker about self-inquiry and she has developed a technique called the turnaround, which essentially creates an opportunity for you to experience the opposite of what you originally believed and to try to find evidence for the opposite of your thoughts. So you take your original thought and you turn it around. I’m going to run you through six of the thoughts that really held me back for a long time when I really wanted to change my drinking, but these thoughts were getting in the way, and I’m going to show you how the turnaround works. It really is just a matter of are you willing to consider that the opposite of what you believe or a slightly different take on what you believe could be true, and are you willing to find evidence for that. Alright, so thought number one. “Not drinking is boring.” Oh my god, I was so on board with this thought because I had used having a drink and used getting drunk as a way to have fun for so long in my life. It was how I let myself be a little crazy, how I let myself be spontaneous. And because I didn’t know how to deal with my anxiety and insecurity when I wasn’t drinking, when I made the decision not to drink and I was left with my anxiety and insecurity, it didn’t feel like a lot of fun. So I could point to so many examples in my life of how the belief not drinking is boring was so true. So how do you turn it around? Well, I’m going to give you two examples for this thought. The first turnaround is this, and now listen carefully, “Drinking is boring.” What? Yeah, drinking is boring. Can you find evidence for that thought being true that drinking is boring? Can you challenge your brain to find evidence that will support that belief? I will tell you, if I was pressed, I could start to find evidence for that. Now, it was hard for me to let go of that belief that not drinking is boring. I held to it really tightly. But if I was pressed, I could start to find evidence that actually, drinking is kind of boring. Because here’s the thing; when you are in the habit of drinking, you’re not looking to do anything really new. You’re just doing the same thing over and over. It’s five o clock, I’m grabbing a bottle of wine. It’s Friday night, I’m heading to the bar. Every weekend, doing the same thing, every evening, doing the same thing. My life was all about making plans to drink. It was kind of dull and uninteresting when you looked at what I actually spent my time doing. So think about that. Can you find any evidence in your life that drinking is boring? You could also try a turnaround with the thought, “Not drinking is boring,” and turn it around this way. “I’m boring without a drink.” I’ll tell you, that one stung a little bit for me when I considered that I was boring without a drink. Because you know what? I was. I wasn’t pursuing a lot in life. I certainly wasn’t going after my dreams. My brain was so focused on immediate gratification. When are we going to drink? When is the waiter going to come over and take my order? When are we making plans to hang out and I’ll bring a bottle of wine? And you know what? Not only that, but when I was drinking, I often told the same stories over and over again. I just got a little bit louder. And I wasn’t trying different activities, I wasn’t extending myself, I wasn’t really opening myself up to a whole bunch of new experiences because my brain was always appeased with that concentrated reward that it got from alcohol. So in fact, the habit of drinking made me kind of lazy to explore new things, and the truth was I was kind of boring without a drink because I had outsourced being fun and outgoing and spontaneous to the glass in my hand. So those are two turnarounds that you can play with if you have the thought that not drinking is boring. Here’s another thought that kept the habit going for me and one that I felt was so true. Thought number two was, “Everybody drinks.” Oh my god, I just held on to that one for dear life. Everybody drinks, everybody drinks, and if I don’t, oh god forbid. That one felt so true for me. Now, here’s a turnaround that you can use. “Everyone doesn’t drink.” Now, at first my brain wanted to reject that like, yeah whatever, fine, everyone doesn’t drink. Mormons don’t drink, alcoholics don’t drink, but that’s it. My brain wanted to kind of end the conversation there. Other than Mormons and alcoholics, I was not willing to consider that everyone doesn’t drink. But here’s the thing, my brain was constantly spotting evidence for finding the people who were drinking. So I actually started disproving this thought in a really unexpected way. So when I was living in New York City, I was really frustrated with my drinking, I was frustrated with the habit, but it felt so impossible to change. Because I had such an intense story that everybody drank, everybody except Mormons and alcoholics. And so all of a sudden, this piece of evidence was put in front of me that kind of blew my mind. And it’s a really interesting thing. I’ve had a lot of clients do this before who are very stuck on the idea that everyone drinks and it is really abnormal not to drink. They’ve done just really simple Google searches where they search for celebrities who don’t drink, and a lot of times, that is incredibly useful for them because the brain is so connected to the idea that everybody does it, everybody does it, and if I don’t drink then I’ll be weird, that all of a sudden, when you get evidence that like, “Oh wait, this person doesn’t drink? I kind of like her, she doesn’t seem like a freak, and this guy doesn’t drink? Oh, I respect him,” it starts to give you evidence. And I’ve been really amazed to see how many clients have been able to just use this technique of finding people that they admire and they respect and recognizing that those people don’t drink and how big of a shift that can be. So if you have latched on ever to the thought, “Everyone drinks,” you can try the turnaround, “Everyone doesn’t drink,” and challenge yourself to find people who you respect and admire and look up to who don’t drink, and that may be a great way to start to disprove that thought. Thought number three, “Drinking too much means something is wrong with me.” Oh, I really held tightly onto this one. That creates so much shame for me, and guess what happens when you feel shame? Well, I hated that emotion and I had created a really good habit of pouring a drink so that I didn’t have to feel my negative emotions. So it really was not a win-win thought. So one turnaround that you can try is, “If you drink too much, it means nothing is wrong with you.” Oh my god, the idea that I could both drink too much and be perfectly okay, nothing was wrong with me, nothing was wrong with my brain, in fact, my brain was functioning exactly as it should blew my mind because I was so convinced that something was wrong with me for so long. But here’s the thing; once I started learning about the brain and understanding how it evolved to seek pleasure, to avoid pain, and to do both of these things as efficiently as possible, I realized how alcohol was actually helping my brain. You know, I taught my brain to use my brain was a way to mask how I felt because I had no idea how to deal with negative emotions on my own. I talk about this in a recent podcast on numbing, but when we numb, we are just finding any behavior that will help us avoid how we feel. And you know what? I did it with alcohol, but once I understood how the brain worked, that I was always on the hunt for pleasure, I was always going to seek immediate gratification unless I interrupted that unconscious, automatic brain, that my brain was always going to try to avoid pain unless I directed it to do otherwise, unless I taught it that emotional discomfort was manageable. Once I started to understand that, I started to see like, oh, this overdrinking that I do, yeah, it could be overeating, it could be overspending, it could be overworking, it could be overwatching. Humans will numb how they feel unless they are given the tools to manage their mind. And so that was a huge turnaround for me, the idea of creating evidence that if I was drinking too much, it didn’t mean that anything was wrong with it. It actually meant that my brain had evolved the way it was supposed to. It was just that no one had given me the tools to learn how to manage it. Thought number four that kept me stuck for a really long time, “Life won’t be as fun without alcohol.” Now, here’s a turnaround for you to consider. “Life is more fun without alcohol.” What? Did I say that correctly? I did. Life is more fun without alcohol. I am totally on board with that statement because here’s the thing; I don’t ever have to worry ever again about waking up and regretting about what I did or said last night, about piecing together what happened, about having that kind of immediate dread of, oh god, did I really do that? Did I really say that? Not only that, but I now experience my positive emotions more fully. I talk about this on the episode about augmenting positive emotions. I’m not constantly on the hunt for oh, I feel joy, oh, I feel connected, let’s add dopamine to the mix. I can actually just experience my positive emotions for what they are and my brain isn’t always hunting for a reward in a vain attempt to make it better. Frankly, I’m just not as clouded. My brain was clouded not only with the hazy memory of what happened the night before, but clouded with so much shame, clouded with so much indecision, so much uncertainty about what to do and how to fix this. You know, now having kind of, not only a crystal-clear memory of what’s gone on, but also just a crystal-clear direction of where I am headed in life and what I want to do and how I want to use my energy instead of always cleaning up from the night before, I will tell you, that makes life a lot more fun without drinking. You can also turn the thought around, “Life won’t be as fun without alcohol,” in a slightly different way. You can try on the thought, “Life is less fun with alcohol.” Can you find evidence for that turnaround to be true? Maybe it’s less fun because of hangovers, maybe it’s less fun because you know what, you’re hanging out with people that you really don’t have much in common with except that you both like to drink. Maybe it’s less fun because you find yourself constantly on the hunt for a reward. You can’t really focus on what’s going on, you can’t really even enjoy the little moments because you’re always wanting to augment it with dopamine. Thought number five, “I’ll always be missing out if I’m not drinking.” That was a toughie for me. I really did always think that I would be missing out if I wasn’t drinking. So here’s a turnaround to try on. “I’ll always be missing out on life if I am drinking.” Really. Think about that one. You’ll always be missing out on life if you are drinking. Because I want you to consider that when you are drinking, when you are constantly in search of a buzz, when you are intoxicating yourself, you are kind of missing out on life. You’re not experiencing it 100%. You’re not experiencing it fully. In fact, not only is your brain constantly on the hunt for a reward, but you’re not fully conscious and present with all these times that you swear up and down are so fun and so enjoyable. In fact, a lot of times you don’t even fully remember what happened. And so think about in your life where you can find evidence that you will always be missing out on life if you continue drinking. And then finally the last thought that I just want to offer you guys a turnaround for, and this one kept me stuck for a long time was, “I’ll always feel deprived if I’m not drinking.” So that sense of I’m always going to have this unmet desire. So a turnaround here that you can try to find evidence for is, “I will always feel deprived if I am drinking.” Think about it. I will always feel deprived if I am drinking. Now that you understand how habits work, now that you know that your brain looks for cues in the environment so that it can remember, “Ooh, this is when I get a reward. It’s 5pm, it’s Friday, I’m hanging out with my best friend, I’m at a restaurant, I’m at a bar I’m at a ball game,” whatever it is, now that you understand how habits work, you see that when you are drinking, when you have created that habit, you will always feel deprived if you’re not giving your brain the reward it expects. Now, you can learn how to change that, but as long as drinking is part of your routine, you will feel deprived. You will have unmet desire if you are not answering the reward that your brain wants. So this is what turnaround look like. You are literally turning around the thought that you have, the belief that you have, the judgment that you have about drinking, about alcohol, about what it means about you, what it means about you if you don’t drink, and you’re seeing if you can find evidence to support to opposite. Now listen, the more dug in you are, the more that thought is worth exploring. And I will tell you, I was really dug in on a lot of these thoughts. There is always, always, always evidence for the opposite to be true if you are willing to look, if you are willing to expend that energy. When you find that evidence, when you see that a new way of looking at the world is possible, that is when you can start to consider an entirely different reality. You can start to understand that maybe not drinking doesn’t mean anything about you. Maybe not drinking doesn’t mean that you’re going to have less fun or you’ll be the odd man out or the killjoy. Maybe actually it can mean something amazing. You have to learn how to use these turnarounds, how to challenge your judgments, how to challenge your thoughts if you want to start to change the story that you have about drinking. Alright everybody, I know today was a little bit longer, but I really wanted to share these turnarounds with you because I think they’re so incredibly powerful, and I challenge you to try them on yourself. Find evidence for how your thoughts that you have right now about drinking, what it means about you, try to find evidence for how the opposite may be true. Alright everybody, I will see you next week. Have you changed your drinking but still feel like something is missing in life? Then you are ready to go in pursuit of a life that blows your mind. I am accepting applications now for an exclusive year-long coaching program that will give you the blueprint to let go of insecurity, anxiety, self-doubt, and to once and for all stop feeling like you need to fix yourself because it is so worth it to create a life that is way bigger and way better than what’s in your glass. If you’re interested, head on over to rachelhart.com/inpursuit to apply.